When Charlie Brennan goes ice fishing on her town’s cold winter lake, she’s hoping the perch she reels in will help pay for a fancy Irish dancing solo dress. But when Carlie’s first catch of the day offers her a wish in exchange for its freedom, her world turn upside down. Charlie catches the fish again and again, but each time, her wishes go terribly and hilariously wrong. Just when things are starting to turn around, a family crisis with her older sister forces Charlie to accept to the fact that some of the toughest challenges in life can’t be fixed by wishing. 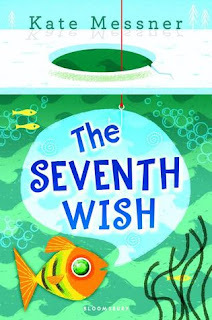 In The Seventh Wish, Charlie feels what we all feel at that age. Invisible. Always coming in last behind everything else. So, when she gets the power to grant wishes, she thinks she can solve all of her problems easily and quickly. Only to find out, life doesn’t always work that way. Kate Messner is one of my very favorite middle grade authors. So, when this book was released, I bought it as soon as I could. And she knocked it out of the park again with this modern day fairy tale. I love how realistically she portrays her middle grade characters. Giving them the perfect voice and giving them life and meaning. In this book she tackles the difficult subject of addiction and handles it with grace and finesse.